When Michigan is Clicking… The Wolverines can play with anyone. You look up and down the roster and there are some nice pieces and all, but on paper they’re not super scary. Yet under the masterful direction of John Beilein, this is the type of team that maxes out its talent. For example, they’re playing the best team defense (by a wide margin) of any team in Beilein’s coaching career. Sophomore pest Zavier Simpson may be the star on that end of the court, but everybody on this team is adept at being in the right place at the right time to make life difficult for opponents. And offensively, while the season-long numbers aren’t to the level of some of the elite Beilein teams, they are plenty capable. Tonight it was Muhammad-Ali Abdur-Rahkman and Mo Wagner leading the way with 24 and 21 points, respectively, but five Wolverines scored in double figures and eight hit at least one three in the game in their blistering and highly efficient pace. Sure, Texas A&M didn’t provide much of a test for the Wolverines tonight, but when Michigan is playing like this, look out world. Bombs Away. While this team isn’t quite as dangerous from deep as the best-of-the-best under Beilein (think Burke, Stauskas, Hardaway or Pittsnogle, Gansey, Beilein), they are still very dangerous. They space the floor, move the ball as a way of life and they’ve got four guys on the roster who have hit more than 20 threes this year at better than a 37 percent clip. Tonight’s 14 threes (on just 24 attempts) combined with their style of play everywhere else meant the Aggies never had a chance. Take the Fight Out of Them. Texas A&M came out of the gates tonight a little flat. Maybe it was nerves or perhaps a little hangover effect from their big win last weekend in Charlotte over North Carolina. Whatever the case, after three turnovers and some sleepy defense they found themselves down 9-4 when the first media timeout rolled around. 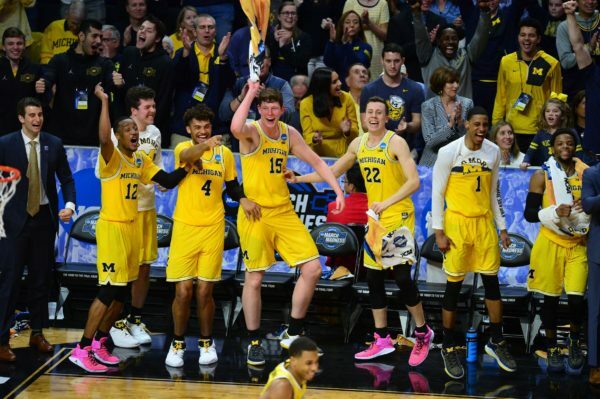 But rather than find an alarm clock during the respite, they hit the snooze button as the Wolverines reeled off a 12-2 run over the next three-plus minutes to take a 13-point lead. The game was never close again, and somewhere in the middle of the first half, the Aggies seemed ready to throw in the towel — visibly shaken and regularly caught giving less than their best effort. While Billy Kennedy got his guys to give some better effort in the second half, there was no point after that first Texas A&M timeout when this game was ever remotely in doubt. Star of the Game. Zavier Simpson. There were a lot of stars in maize and blue tonight, but Simpson was the catalyst on both ends of the court. Defensively, he is an ever-present pest that makes even the simplest offensive maneuvers for opposing guards difficult. When he’s got the ball in his hands, he is quick, decisive, smart and dangerous. Tonight he contributed 11 points, five assists and six steals, numbers that only begin to describe the positive impact he had on the game.